Australian Prime Minister Tony Abbott says satellite imagery has found objects possibly related to the search for Malaysia Airlines flight MH370. However, Thursday's search ended after nothing was found, but the investigation will begin again on Friday. Experts warned that the objects, situated about 2,500 km (1,553 miles) south-west from the Australian city of Perth, picked up in the satellite imagery are "relatively indistinct," yet large enough to warrant sending a research team to investigate exactly what the pieces are. Two objects have been spotted in the Indian Ocean, Abbott told the Australian parliament. "New and credible information has come to light in relation to the search...in the south Indian Ocean," Abbott said, according to Reuters. "The Australian Maritime Safety Authority has received information based on satellite imagery of objects possibly related to the search." “The task of locating these objects will be extremely difficult...and it may be they do not relate to the aircraft,” he added. Although Thursday's search is over, after being hindered by cloudy weather, the investigation will resume on Friday morning. Abbott said a reconnaissance team is on the way to retrieve the suspected debris. An Australian P-3 Orion aircraft is due to arrive at the scene around 14:00 local time (03:00 GMT). Three more aircraft were also sent to the site, according to Reuters. Abbott said he has notified Malaysian Prime Minister Najib Razak. Thursday marks the 13th day in the search for MH370, as five merchant ships in the southern Indian Ocean are working in conjunction with surveillance aircraft from Australia, the United States, and New Zealand. John Young, emergency response division general manager at the Australian Maritime Safety Authority (AMSA), speaking at a press conference on Thursday, said: “The image is in the vicinity of the search area defined and searched in the past two days. Further images are expected after commercial satellites were redirected to take high-resolution images of the areas of interest. Young then provided some information on the makeup of the recovery mission. “Four aircraft have been reoriented to locate the objects, approximately 2,500 km south-west of Perth, as a result of this information," he said. “A Royal Australian air force Orion aircraft arrived in the area about 1:50 PM this afternoon. A further three aircraft have been tasked to the area later today, including a Royal New Zealand air force Orion and a United States Poseidon aircraft. Meanwhile, investigators are searching other possible leads in the mystery of the disappearing commercial airliner, including the private lives of the pilots. On Thursday, it was reported that the FBI is analyzing flight simulator data from the home files of the MH370 pilot after the Malaysian government sought its help in retrieving electronic files deleted last month. A government official spoke to AP about the investigation on condition of anonymity while confirming that the FBI has already been given the data. Files with records of simulations undertaken using the device were deleted by the pilot on February 3, according to Malaysia's defense minister. Meanwhile, authorities in the Maldives are investigating reports that islanders saw a "low-flying jumbo jet" on the day MH370 disappeared. The investigation was instigated by a report on the Haveeru news website that several locals had spotted a large plane flying over the remote southern island of Kuda Huvadhoo on March 8. Airport authorities in the small island ocean – located in the Indian Ocean – said there was so far no “credible” information to back up the claim. 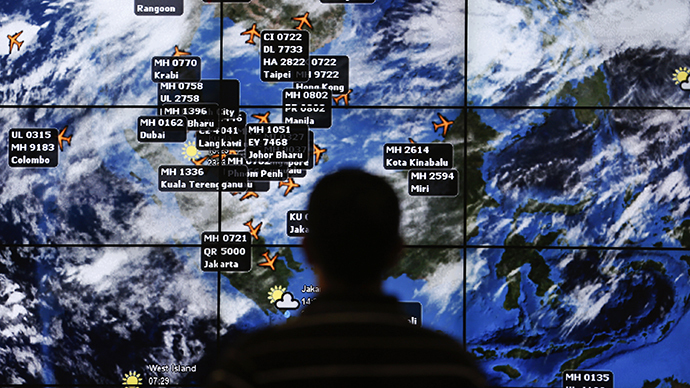 The islands' National Defense Force said that no trace of Flight MH370 had been picked up on radar. 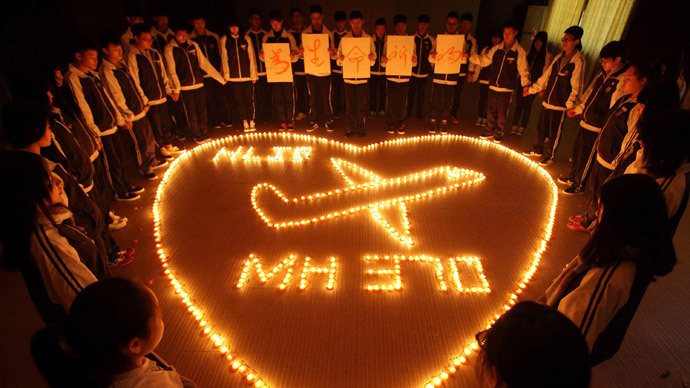 Malaysia Airlines flight MH370 carrying 239 people left Kuala Lumpur on March 8 destined for Beijing. The plane changed course via the cockpit’s computerized Flight Management System, not by manual control, American officials suggested this week. The Boeing 777 plane mysteriously disappeared around one hour after takeoff.